Rap – Rhythm and Poetry – has huge potential for foreign language teaching. The precise rhythm and clear pronunciation present learners with a challenge at first, but then bring them on. You too can bring the chant of rap music into your learning space with the exercises shown here. Public speaking and communication apprehension are often closely related, particularly in an academic context – even for native speakers. To improve the verbal presentation skills of foreign students and also to alleviate their fear of giving presentations, students at the Leibniz University in Hanover can take a language rhythm course with the focus on rap. On this course, students compose their own texts and practise performance. They reflect and overcome their anxiety through preparation and routine. But they are also relearning standing, breathing, walking and seeing. Sustaining pauses, flamboyant gestures, controlled facial expressions, effective breathing: all these things foster confidence and reduce the fear of making mistakes, if not actually making mistakes. As the course progresses, students with speech problems turn into hip-hoppers. This kind of artist is certainly permitted to make mistakes. Even though the focus is constantly on language, being free of anxiety about making mistakes liberates an enormous personal potential. The students await the closing event with great excitement. | Photo: © Matthias Perner hythm and Poetry (rap) in language teaching quickly convinced me as a teacher, despite a large dose of scepticism. Speaking to a rhythm stimulates the cognitive (and emotional) link between linguistic elements, such as word and phrase emphasis, intonation and meaning, sounds in context, as well as pauses. At some point it all falls into place for the course participants. When that happens, the rhythm carries their speech and makes it easier. The language rhythm remains even without music. This access via music is often entirely new for learners, and is unfortunately omitted from many textbooks. The fact that students can reduce their communication apprehension through rapping was only a secondary realisation. Since 2009 our courses in aesthetic communication (“creative courses”), which include drama, poetry and rap, have finished with a public closing event.Also the “rap” course participants are videoed for the whole semester to illustrate – for the benefit of themselves and me – the progress or added value of this approach. Furthermore their language level is raised with interviews and reading texts before and after the semester – with an additional spontaneously rapped newspaper article at the end. You will find numerous rap loops online. However you need to observe the copyright when you use the repetitive sequences of drum rhythms and bass lines. “Music Maker” software costs less than 20 euro. There are even free alternatives. The software is intuitive to use, and the result really “grooves”. Alternatively just a metronome (online) is enough – a device that produces a beat mechanically for a pre-set tempo – which can be used for applications such as optimisation of tongue-twisters. So neither musical nor extensive technical knowledge is necessary! But if you enjoy technology: the little red light of a studio microphone increases concentration and self-reflection considerably. Hearing your own voice through the headphones influences the “native language filter” and it is easier to spot interference from the native language. After an introductory rap performed by the teacher, which is by definition unprofessional, the course participants recite a short poem together without being told when to start. It quickly becomes clear that it is the implicit rhythm of the text that makes it possible to speak in unison in the first place. By the fourth attempt at the latest, the group is dealing with intonation and phrasing very homogeneously. The first text done by the participants about themselves consists of four lines (measures), each with four stressed syllables (beats). To begin with they tend to rap the text hesitantly to the music using a microphone. This first exercise is suitable for all language levels and is also hugely effective within a short time. Text work, creating a rhythm, pronunciation, presentation and optimisation are recurrent elements of the course, which also includes text analysis, body percussion – using your own body to generate rhythms – chanting, beat-boxing and mnemotechnics. The seminar content seems to be nothing more than a way to achieve the goal that is the closing presentation. But in reality it’s the other way around. The teacher only gives advice for the text production and editing. As with good academic texts, raps also follow a certain dramatic structure, which is learnt both individually and through working as an intra-cultural team. The cognitive activity of finding rhymes – not by looking for translations or word categories, but by trawling through a mental sound inventory classified by phoneme, is unaccustomed for learners and requires training. Online rhyming dictionaries can help here. When the course participants compose texts, they change semantic units if necessary, which challenges their synonym-finding skills. Their pronunciation problems are also reflected here. “Learn to walk when Mum beckons – not by looking at your own feet”. This “mantra” illustrates how this approach is action and task-focused. “Mum” is the closing event, the feet, or in this case the language, automatically keep up as motivation increases. 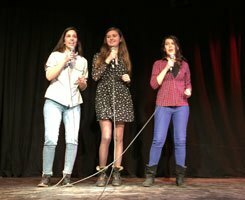 Foreign students who stand in the spotlight in front of an audience of 100 people and perform their own rap texts in a foreign language have definitely learned to “walk”! The course participants are justifiably proud of their achievement. Even if they lacked confidence beforehand, they consistently hope their achievements are published as a podcast or video. Rap in foreign language lessons could and should be used more frequently, because it’s good training for linguistic units that have often been overlooked until now. Furthermore, rap represents an enormous intrinsic motivation, and fits in perfectly with the currently favoured methods for a hands-on, collaborative, autonomous and communication-based learning process. Perner, Matthias (2014): Musik im DaF-Unterricht: Von der Sprache zur Musik – und zurück. In: Bernstein, Nils/Lerchner, Charlotte (Ed. ): Ästhetisches Lernen im DaF-/DaZ-Unterricht. Literatur - Theater - Bildende Kunst (= Materialien Deutsch als Fremdsprache; 93). Göttingen: Universitätsverlag, p. 313-334. Stöver-Blahak, Anke/Perner, Matthias (2011): RaP im Deutsch als Fremdsprache-Unterricht – „Es hat Spaß gemacht und trotzdem haben wir etwas gelernt.“. In: Hahn, Natalia/Roelcke, Thorsten (Ed. ): Grenzen überwinden mit Deutsch (= Materialien Deutsch als Fremdsprache; 85). Göttingen: Universitätsverlag, p. 311-326. Matthias Perner is a research assistant at the Centre for Applied Linguistics and Special Languages at the Leibniz University Hanover, where he works in the field of test development as well as lecturing in GL and ESL. The concept “Language and rhythm” originated through his collaborative work with Dr. Anke Stöver-Blahak.